We would like to take this opportunity to welcome and invite you to visit us at EscrowOne! Selling a home can be challenging, however, with the best Escrow Company at your side, your transaction can close fast, efficiently, and effortlessly. EscrowOne is a licensed Escrow company with the California Department of Business Oversight. We are also insured by the Escrow Officer’s Fidelity Trust Fund, that ensures 100% of our clients’ trust funds. Our professional teams are here to be your partner and serve as a neutral party for your real estate transactions strictly following all ethical standards. We provide personal service to each of our clients with our expertise and dedication to exceed customer expectations. With over 18 years of service in the escrow business, EscrowOne, Inc. has the advantage of providing you with uncompromising peace of mind. EscrowOne, Inc. is founded on ethics and integrity. We firmly believe in doing what is right; this means putting our clients’ interests first-every time. As an independent, full-service escrow company, EscrowOne, Inc. provides the utmost professionalism and knowledge, taking a team approach to each client relationship. EscrowOne, Inc. is Green! We pride ourselves with the best paperless software to safeguard and store your escrow file for the required time-period and beyond. Technology is key in providing you the best service available while expediently closing each transaction. Our ability to gather a team of experienced professionals is evident, our Escrow Officers have over forty years of combined escrow experience. 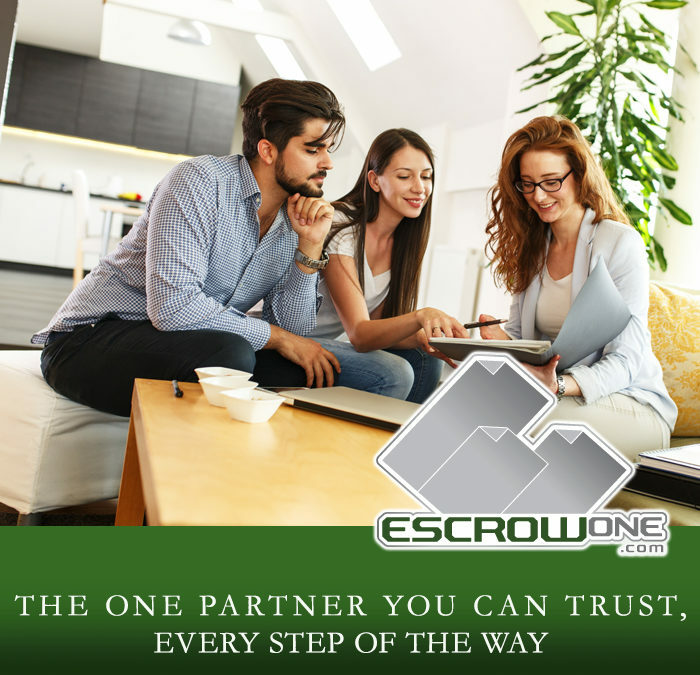 This is why, since the late 1990s, the leading brokerages, lenders, real estate agents, and corporate clients continue to choose EscrowOne, Inc. as their trusted escrow choice. We look forward to meeting you and thank you for your trust in servicing your next escrow transaction.